The experts in online payments (for online stores) chat with us about pop up shops ! The article contains comments on why businesses should consider pop up as an option for increasing sales and building their brand, how to find locations, equipment and insurance… and a few hints on promoting and running a successful pop up ! If you’re an online retailer, having a pop-up shop is a fantastic way to move stock, give your customers a chance to see and touch your products and rustle up new interest in the business. But if you’ve never had one before the idea can be daunting. We speak to popUPshops Australia and instant retail founder Scott Williams to find out what you need to know. Tell me about your pop-up shop support businesses. I launched instant retail in 2010. My personal background is in exhibition management, design and retail shop fittings and I started instant retail because I saw an opportunity to service the rise of pop-up shops and the business is still pretty unique – I’m certainly the only one who does this in Melbourne. At instant retail we are basically a hire service – people hire specialist retail fittings such as racks, tables, the counter – and get help with the logistics of moving in and out. In 2012 we started popUPshops Melbourne – which has since expanded to popUPshops Australia – as a resource that people can go to for potential current locations, to find out what pop-ups are happening, what the global trends are… It includes a lot of free information as well as offering paid promotions for pop-ups and landlords with potential pop-ups. This business also functions as a consultancy for people planning a pop-up. What are some of the main reasons businesses try a pop-up? To meet customers and get their feedback – it’s a great opportunity to learn more about customers and find out what they do and don’t like. Expand a database – always try to record customer details when you have a pop-up. To try out a location before opening a permanent store.It’s hard work and often involves a lot of legwork and effort. Start by choosing your area first so that you can be near your demographic. Do you want to be on a shopping strip or in a shopping centre? Take a walk along a street you’re interested in and if there are any empty shops take note of the agent’s details and give them a ring. If there’s already a pop-up shop in the area go in and ask them how long they’ll be there for, you might be able to speak to the agent and come in after them. At a shopping centre they’ll sometimes book a space in advance, but it’s often a more expensive option. On my site we have a list of available spaces, too, which I try to keep up to date.That depends what they’re selling. People often rent general fittings such as the racks, shelves, a counter and sometimes a till, then purchase smaller display items essential to their products such as hangers, price tags and signs. People also generally want Eftpos and I strongly recommend they go to their bank about that in good time as they can take several weeks to get the terminal to you.There are a few brokers who specialise in pop-up insurance. You can Google those, and one advertises on my website. With pop-ups you should always have public liability. You might also choose to insure your own stock and contents, and sometimes the landlord will ask you to insure the glass shopfront.Yes, we call that a collaborative pop-up and it is usually a group of like-minded people with complementary products. It can make the store more interesting and also means people can share the costs and the staffing, so it’s a great idea. When I started about seven years ago I had to explain what a pop-up shop was, but nowadays everyone is familiar with the concept – it’s entered the lexicon. It seems there’s broader acceptance amongst real estate agents and landlords, and some shopping centres now keep spaces available for a rotating mix of pop-up retailers. Most large shopping centres have a department that used to be called causal leasing but over recent years they’ve rebranded themselves to include pop-up leasing.How can people promote their pop-up?What are your tips for running a successful pop-up shop experience? Social media is important and low cost. Create a Facebook event, Twitter feeds and send images out on Instagram once the store is open… You can usually advertise on the storefront and create an eye-catching window display. It’s also invaluable to go and speak with surrounding retailers – it will drum up interest and they’ll sometimes put up a flyer to promote the pop-up for you. It also prevents any suspicion or anxiety about the “new business” in the strip. The rise in online retail has definitely meant there are more businesses that occasionally want access to a bricks and mortar store. 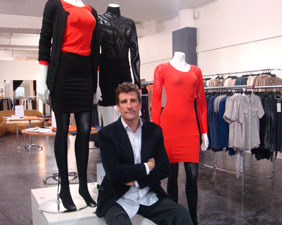 Pop-ups are also regularly used to move sale stock – for example we support many Australian fashion designers with their pop-up sales around Melbourne. What changes have you seen in the pop-up shop world in the last five or 10 years? Do people often source stock from other businesses for the store as well as their own, or do most businesses just sell their own items? What kinds of equipment do people need? How do people find a suitable location? Plan well ahead, so you’re ready to hit the ground running when a space becomes available. The planning is in the location, the promotion, making sure your stock is at hand, staffing and your equipment. Don’t cut corners, even though you might be trying to do it economically. Present a professional retail experience. Shoppers aren’t too forgiving – if you have wobbly tables and tired equipment it makes the stock look cheap. Spend the time and effort to make sure the store looks attractive and think about bringing in “theming” products such as plants and other props to create a mood. Consider your pop-up as a great chance to meet your customers, but if you’re not a people person it is fine to hire people to do the selling for you – you want to give your customers the best experience possible. Make your pop-up shop memorable with unexpected features and regular events. Giveaways can be a great way to capture customer details. When people don’t define their objectives. It’s fine if you’re in it for the revenue or just to move some stock or to build a database and meet customers, but it helps if you’re clear on your goals before you begin. When people give up too soon. Hopefully before you launch the pop-up you’ll promote it through your database and social media, but you might find you get a surge at the beginning that dies off. And then your initial customers will return and they’ll tell their friends so it picks up again. Expect it to ebb and flow. Demanding low rent. Even if a shop is vacant, if it’s in a great location you should expect to pay a realistic commercial rate. Occasionally you can get a great deal because it suits the landlord or they just want someone in to stop the graffiti and vandalism, but don’t expect to haggle too much. Not following up with new contacts. Having a shop is a great way to expand your database, but make sure you follow up afterwards to ensure those pop-up customers convert to online customers!